Congrats to the 8 competitors advancing to Burbank for the Madden Challenge. The final 8 from both the xbox one and ps4 64 man brackets were placed in four 4man round robin groups. The Top 2 from each group would advance to Burbank. On the Xbox one side you have ImSryBoutThat and IgBoogz advancing from group A. IgBoogz Edged out Draggggg and DubDotDubby with his -2 point differential. Group B on the Xbox one side was hell but Too Tenacious and TelaxnTakenot3s managed to make it out . On The Ps4 side DJones and NFL-Sixth-Sense made it out of a tough group A, that consisted of community great Secret and Lion Blood. Both had solid performances but came up short in the round robin. 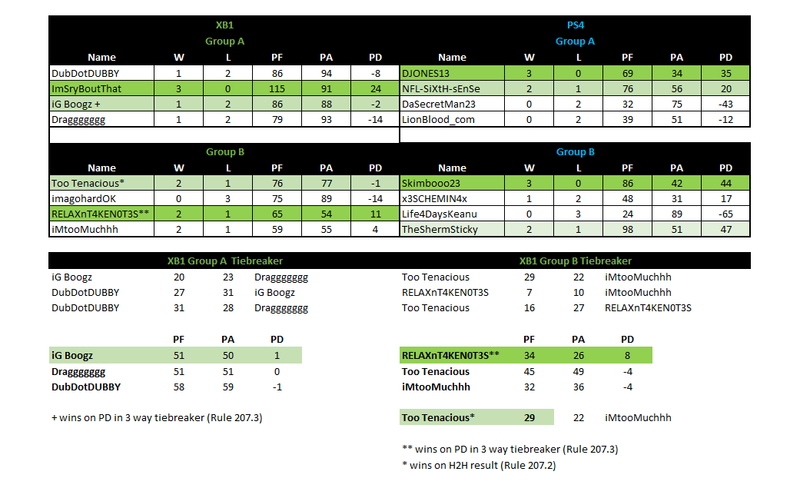 Group B Produced Skimbooo23 who has been buzzing all year long on the ps4.Group B also produced TheShermsticky. Sherm sticky is known for capping and has already announced that if he win’s it all he will donate his winnings because he simply doesn’t need it. Congrats gentlemen Madden Underground wishes you all the best of luck.